The SXSW show here in Austin has drawn to a close. During the last four days I’ve been listening for chatter about the new web and mobile services that are turning heads at the show. I heard lots of talk, and some of it turned out to be true. I’m tired and a little frazzled (like everybody else here), but it’s three hours until I get on a plane home, and high time to round up my favorite “buzz” apps from the show. So here goes. It seems fitting to start with Gowalla--everybody here seems to be using either it or arch rival geolocation service Foursquare on their smartphone. Gowalla isn’t exactly new, but it got a big dose of geek credibility two nights ago when it beat out Foursquare for a SXSW Web Award in the “best mobile app” category. In a nutshell, you use Gowalla to share your locations with your friends. On Facebook I often see my friend David’s Gowalla “check ins” from various places around the world. His check-ins show up on his Twitter feed too. The places David goes sometimes already exist in Gowalla, but if not he creates a place (i.e Max’s Diner, Brooklyn) and then checks in. Gowalla uses the GPS radio, and a bit of Wi-Fi network triangulation to tell where he is on the map. But the reason Gowalla stands out in the geolocation app crowd is because of the level of game play it injects into the experience. When you check in somewhere, you’ll discover that Gowalla has associated various items with the place, like a stamp at the post office or a taco at Torchy’s Tacos (Austin, Texas). 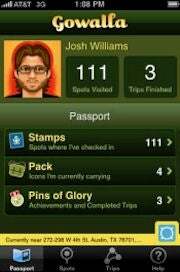 You can grab some of these items, but you have to leave the same number of items behind for other Gowalla users to collect. Gowalla is now available for iPhone, Palm and Android. 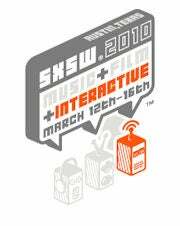 One of the coolest things I saw at SXSW was the Spotify mobile music app demonstrated on the tiny Sony Ericsson Xperia X10 Mini running Android. Why am I writing about an app that’s not available in the U.S.? During his speech here today, Spotify co-founder Daniel Ek showed the app running on the X10 mini, which he said should release here in the few months. I think the suggestion is that the Spotify app will be available on that phone when it starts selling here. Spotify is already a very cool free music app, but seeing it operating so elegantly on such a tiny device was truly impressive. The app had a very Android-y flavor – simplicity, quickness, intuitiveness and a minimum of touches to get to where you want to go. When and if Spotify is made available to U.S. mobile subscribers, it’s going to be a serious contender for the “top downloads” spots in the mobile app stores. We’ll have more on this later. Visit Spotify's Android app page for more details in the meantime. Nearverse’s LoKast, which launched here at SXSW, allows you to broadcast all kinds of stuff from your phone to ad-hoc networks of people who happen to be within 300 feet of you. Say you’re on the bus, and you want to show the folks around you who you are, who your friends are, or what you are listening to or watching--your phone and the app will detect them and ask if they want to “tune in.” They can even tune in to a real-time view of whatever you’re browsing in your browser. Unfortunately, you’ll only be able to connect with logged-in LoKast users, so the cool factor will only be there if lots of people start downloading the app. The service detects which networks—Wi-Fi, cellular or Bluetooth—are available and connects to the fastest one. LoKast is free and available only on iPhone app now, but an Android app is in the works and will likely appear in the coming months. Check out the LoKast demo video here. The Berkeley, California-based MOG music service announced a cool new mobile app here at SXSW (for iPhone and Android), and it looks very promising. 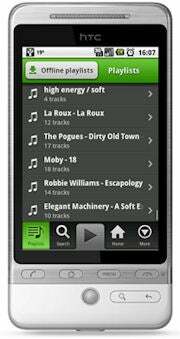 The app, called MOG All Access” is a cloud-based mobile streaming music service that will give mobile users unlimited access to about 7 million songs and podcasts for $10 per month. “The whole point of putting music in the cloud is to be able to get to it whenever you want it, from anywhere and mobile was always an end goal for us,” said MOG founder and CEO David Hyman. MOG All Access has many of the same features as the desktop app, including the ability to tap on a specific artist to form a customized stream of songs that can include only tracks by that artist, or tracks only by related artists, or a mix of both types of tracks. The best feature by far in the new mobile version, however, is offline listening mode. 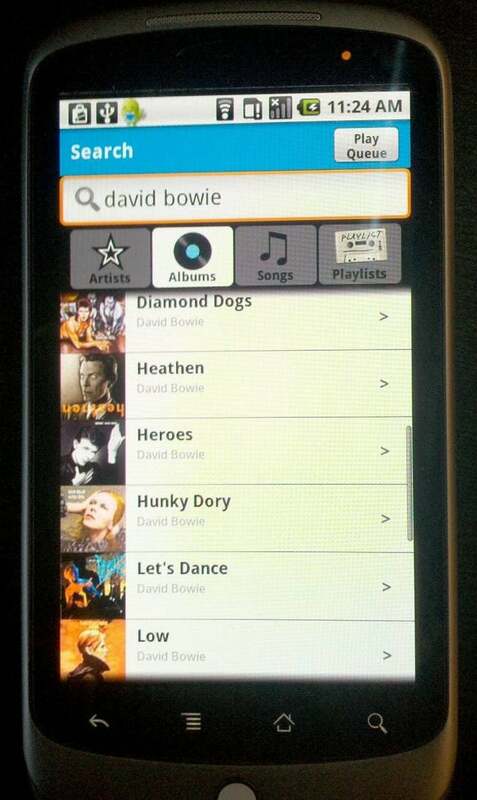 Mobile MOG allows you to download songs into a local cache on your phone while you have a good wireless connection, then listen the tunes later on when you’re out of network range. For instance, you could sit in a Wi-Fi hotspot in the airport and cache a bunch of music to listen to in offline mode during the flight. The new app could become available as soon as next month. There are lots of build-your-own-website apps out there, but I was particularly impressed with Flavors.me from Florida-based developer Hii Def. 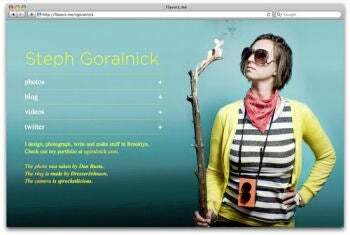 It lets you pull a variety of personal, web-based content into your page. This can include social networking status updates, music playlists, photo streams, videos, your resume on LinkedIn—whatever; Flavors.me then whips it into a “constantly growing visual montage,” as company founder Jonathan Marcus Founder, CEO calls it. The presentation is very clean and artistic, as shown in this sample page created using the service. After you sign up, Flavors.me asks you to fill in three sets of data. First, you fill in your profile information (name, bio, interests, etc.). Then you tell the Flavors.me what web services you want it to pull content from to populate your page; your choices include everything from Twitter to Foursquare to YouTube to Facebook. Finally, the app gives you some choices about the design of your site—things like layout, colors, background and font. And that’s pretty much it.